Family Villa w/Private Beach, Pool & Staff -FREE Chef Package Sept - Ask Us! 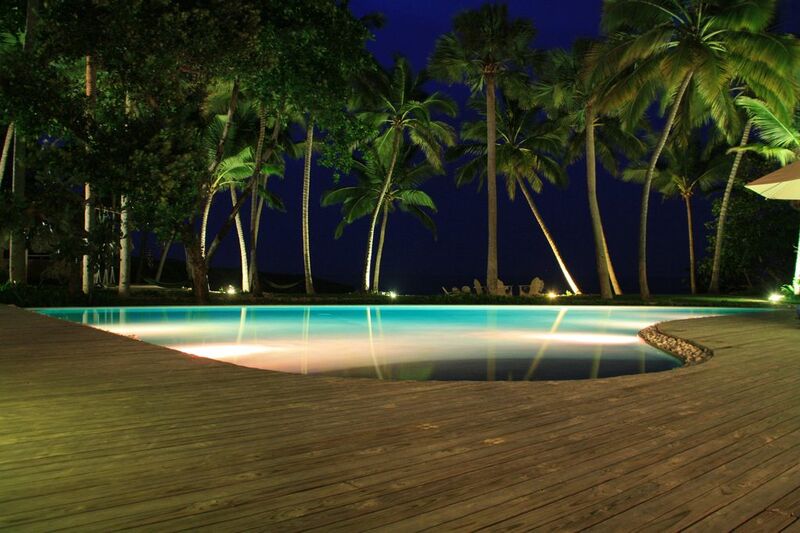 We provide the very finest luxury beachfront vacation offering on the north coast of the Dominican Republic. We can accommodate multi-family groups up to 20 total guests with a combination of adults and children. Wind Song includes four large family suites. Within one of the master suites is a seperate bedroom for up to two guests. Each suite is 800-1000 sq.ft. in size. Ideal for four familieis with children or for up to four couples. Expanded capacity for up to 9 couples or 25 total guests available by adding adjacent Villa. Please ask for a custom quotation for your group. Located within the secure resort community of Sea Horse Ranch, , Villa Wind Song captures the essence of relaxation, making the quintessential beach home a reality. Asian influences are seen in the raised wooden entrance and the outdoor walkways, as well as the beachfront gazebo facing the sunrise for yoga, reading, or meditation. A gourmet kitchen with adjacent herb garden and BBQ overlooks the ocean. Unique features including the beach side beach bar & bonfire pit provide an oasis for casual entertaining. Surf, paddle surf, windsurf & snorkel from your own beach! Walk for miles to the east of Wind Song and discover several beautiful semi-private beaches, tidal pools and walking trails. A tropical masterpiece where the line between outdoor and indoor living disappears creating an ambiance of nature and enjoyment rarely available in residences around the world. Our professional staff is discrete and dedicated to your satisfaction. As owners we are on call for all your questions and requests both before and during your stay. Please watch the Wind Song Feature Film to learn more. We offer chef service packages , at additional cost, to meet your desired needs. Please inquire. NOTE- All food and beverage expenses are the responsibility of the client. Designer & builder of Villa Wind Song is American from Minnesota. Our family resides part of the year at Wind Song & the remaining months at our home in Colorado. Located in Safe / Secure Gated Resort Community - No Need to Lock Our Doors. Staffed, Family and Couples Retreat, Hiigh speed wireless inter-net, cable TV, theater room, bon-fire pit on the beach and zero entry chemical free infinity pool. All water throughout this villa is safe and healthy for consumption. Chemical Free Pool treated with Ultra Violet Light. Pre-Arrival Concierge service included. Complimentary Airport Transfers - Great English speaking driver with Van available for all local transportation at additional cost. Child friendly with incredible childrens playground, walk out your door and take a beach walk for miles...........Surf, Windsurf, Kite Surf, Snorkel, Swim and Relax.............Six bikes for clients to use. Complete beach View from the property. We are beachfront with the ability to walk miles on the beach right from our backyard. This combined with a completely secure envirnment results in a very special and private setting. All bedroom linens are provided and changed twice weekly. Google Wi-Fi Network covers 90% of property. 55' LED TV in theater room Plus 42' LED TVs in two master suites. Yes - Four adult bikes & two children's bikes for client use. Afdditionally, the Resort Pool with waterfalls and beach Club within walking distance. Villa Wind Song is an amazing place to stay! Villa Wind Song is a truly beautiful home to stay at. The views, the breeze, the house, the staff - all first rate and very welcoming. We were 2 families travelling together with 5 kids between us. This house is a great place for multiple families to stay. Each bedroom was very comfortable and the layout of the house is perfect - either for hanging together or getting some space. Every detail is well thought out and the staff are really lovely and attentive to any needs one might have. The owner has taken a lot of time and care to make the experience seamless and easy and is also on call should any extra needs arise. The whole experience was relaxing and very well orchestrated. As the house is situated on the beach, it added an extra bonus for us as we had direct access to the ocean. The water at this time of year was a bit rough at times that we didn't feel it was so safe to go in. However, most days we swam off the beach, but we were careful. Other than that, there is not much else to say expect that everything was wonderful. Thank you Michael, Lucci, Sol and Eliah for facilitating an amazing vacation - we all had a fantastic time. Thank you for your kind remarks. We are so pleased you all had such a great holiday and we hope to serve you all again soon. Excellent villa almost above wildest expectations! Excellent villa almost above wildest expectations. Very nice interiors. 4 bedrooms that easily fit 12-16 people (we were 10 adults and 8 pre-teens/teens and used the TV room as well as a bed room). Best pool we have ever had, clean water and no red eyes, and the tap water is safe to drink! We have rented villas via Homeway/ VRBO many times, all around the world, always trying to find something new and if possible better. This one is going to be hard to beat, so villa Windsong maybe we meet again! Thank you for the kind remarks and we are pleased you all enjoyed the stay. Hope to serve you all again in the future. We live in paradise in the Roaring Fork Valley of Colorado so our expectations are high. Villa Wind Song exceeds all expectations; emaculate, safe, friendly. An easy 10 minute drive to the airport. If you are in Aspen, Basalt or Carbondale this is just the place to escape to to RELAX. If you are a cook the kitchen rivals any and there'splenty of fresh local food to choose from. The pool is perfect for kids and adults. The beach is 50 steps away and provides the perfect white noise to fall asleep to. Would visit again and again. It's a paradise and we hardly left during the course of the week. All rooms are spacious and well designed with views to the ocean and pool. Plenty of on site activities but the private beach is the biggest bonus. The staff operate like worker bees each morning to see the villa is kept just as if you arrived on day one. This place is run like a tight ship and the owner sent our deposit back swiftly after return. Michael is honest and transparent about the booking, offering unparalleled hospitality and concierge prep. Food was on point with exactly what we requested and the suggested driver was our personal guide for when we wanted to tour the town. Overall in all it was a slice of heaven and throughout all my years in renting scenic properties in the D.R. I'd say this one is my favorite. Well thought out and well equipped home with lovely accommodations for our three generational family of nine. The staff is professional and very helpful, attending to all our needs. The pristine sand beach is wonderful as is the swimming pool. It was great to have a chef preparing custom dinner for us! We had a fun adventure day arranged by a local outfitter. We all loved our stay at the the Sea Horse Ranch! Surfing, Paddle board, kite sailing lessons all available nearby. Terrific eco-tours with mountian biking, canyoning or kayaking all nearby. Tennis and horseback riding available on-site within Sea Horse Ranch. And a world class grocery store only two miles from the villa. Owner reserves the right to adjust the rate up or down depending on client profile, needs and other conditions. Our refund policy provides a 50% refund if booking is cancelled 90 or more days in advance of arrival date. In the event of a customer hardship that requires cancellation, owner will also allow the reservation to be rescheduled.